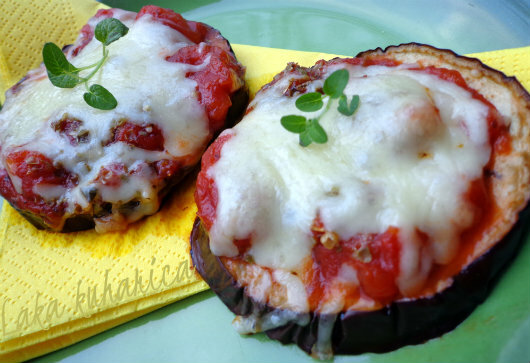 Place eggplant rounds in a non-stick pan greased with olive oil and bake in the oven for 10 minutes at 230°C. Remove the pan from oven, but leave baked eggplant inside. 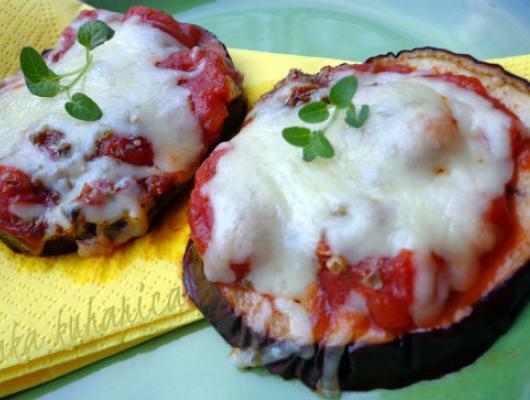 Cover each eggplant round with one spoon of chopped tomatoes, sprinkle with oregano and basil leaves. Top with grated cheese and bake an additional 5 minutes in the oven at the same temperature, until cheese is melted and golden brown. Serve pizzette warm or cooled as an appetizer or as a stand-alone small meal.